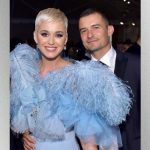 Katy Perry and Orlando Bloom are engaged — and if a story in People magazine is to be believed, they’re hoping that in the near future, baby will make three. Bloom has a son, eight-year-old Finn, with his ex-wife, Miranda Kerr. Katy’s previous marriage to Russell Brand produced no children. Katy and Orlando took in the Coachella Festival over the weekend. Last night, Katy was back on American Idol for the first show during which America was able to vote.